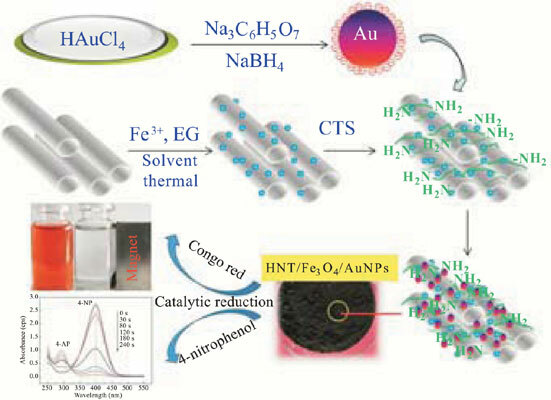 Objective: A supermagnetic halloysite/Fe3O4/Au nanoparticles (HNT/Fe3O4/AuNPs) nanocomposite was fabricated by a facile non-covalent self-assembly approach and used as a recyclable catalyst for the hydrogenation of Congo Red (CR) and 4-nitrophenol (4-NP). Method: The AuNPs were successfully decorated onto the HNT/Fe3O4 carrier using natural polymer chitosan (CTS) as a “bridge”. The formation of the nanocomposite and the uniform distribution of AuNPs on the HNT/Fe3O4 carrier were confirmed by UV-vis, FTIR, XRD, TGA and TEM analyses. Due to the successful loading of small-size AuNPs, the resulting HNT/Fe3O4/AuNPs nanocomposite showed very good catalytic activity. At a low catalyst concentration (0.25-0.5 g/L), the nanocomposite can catalyze the rapid decoloration of the 25 mg/L CR solution within 4 min and rapid reduction of 4- nitrophenol (4-NP) into 4-aminophenol (4-AP) within 5 min through a catalytic hydrogenation reaction in the presence of sodium borohydride. Result: In the catalysis reaction process, the AuNPs acted as the “courier station” to promote the electron transfer and thus accelerated the reaction process. After reusing for 8 catalysis cycles, the catalytic activity of the nanocomposite still remained good. In addition, the nanocomposite showed the maximum magnetization rate of 33.6 emu/g, which made it easy to separate it from the solution by a magnet for recycling and reusing. Conclusion: In a word, the nanocomposite has potential to be used as a high-efficient catalyst for the decoloration of dye and conversion of 4-NP by a hydrogenation reaction. Halloysite, magnetic nanocomposite, dye, 4-nitrophenol, congo red, catalysis.